It takes courage to walk into a new place. Church is often filled with strange faces, unfamiliar surroundings and different traditions. However, you should know that the people who make up the Millwood Church of Christ are ordinary people just like you. They are also seeking answers to life’s biggest questions and making some good friends along the way. You are welcome to join us for weekly participation in communion, biblical preaching, learning opportunities for all ages, and fun youth activities. 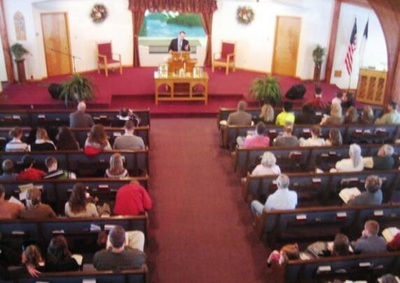 While we sing traditional hymns, accompanied by a piano, you will find our congregation to be lively. With a unique balance of young and old, marrieds and singles, adults and children, you are sure to find a place to fit in. On Sunday mornings some men wear ties, some women dress up, some dress casually, and all will be glad you came! It is our hope that this is the congregation for which you have been searching. We are located at the crossroads of routes 36 and 62. Once in Millwood, go north on Bridge Street and continue down the hill into our parking lot. We’ll admit, we are a little hard to find, but if you follow the directional signs you will find us.